To Sum It Up: In a world where Darwinists and Clankers compete in a war that will decide the supremacy of animals or machines, Deryn Sharp and Prince Aleksander are caught right in the middle. Deryn yearns to be in the air. She wants to be in the British Air Force, flying on beasties and serving her country. There is one small problem, though. Deryn is a girl, and girls are not allowed in the air force. Forced to disguise herself as a young boy, Deryn lands herself a spot on the Leviathan, a famous giant whale airship. The Leviathan is Britain's prized possession; not only is it a brilliant ship, but it can also support an entire ecosystem, and Dylan, as Deryn now goes by, is more than proud to be a part of it. From hiding her secret, to training as a midshipman on the Leviathan, to fraternizing with Clankers, Deryn has a lot on her plate, especially with the war coming. Prince Aleksander has led a pretty charmed life, up until now that is. Alek's father, the heir to the Austro-Hungarian throne, married a commoner, leaving Alek illegitimate in the eyes of his family and making Alek's claim to the throne almost nonexistent. When Alek's parents are murdered by whom he suspects to be his own people, Alek is forced to go on the run from his own country. Hated by the Darwinists for being a Clanker and chased from his own Clanker country by his own people, Alek is left with a small walker, a Clanker battle machine, as a home and a small band of loyal crewmen as his family. When Alek and Deryn meet, not only do both change each other’s lives forever, but they also might just be able to change the tide of the war. Review: Leviathan was a beautifully written book with elegantly crafted illustrations. Yes, illustrations. There is at least one in every chapter of this stunning book! It was like a nice little present every chapter; I looked forward to each new picture, and I wouldn't be lying if I said the illustrations added to my enjoyment of the book. Besides the amazing pictures found in Leviathan, the story itself was something else. Scott Westerfeld wrote a whole entire world when he wrote this book. Leviathan is my first steampunk novel, so I thought the whole idea was fascinating and captivating. Westerfeld describes the genetically engineered animals and Clanker machinery vividly. And if you don't get the whole picture Westerfeld is trying to get across, all you have to do is look at the illustrations on the next page, which capture the scene perfectly. Westerfeld also incorporated factual, historic events into the story. Leviathan most undoubtedly is taking place during World War I. I found it extremely fun to connect real life events with their fictional counterparts. And reading Leviathan while I was taking A. P. World History didn't hurt either. Although I could gush about the setting of the novel forever, I would really like to move on to the main characters. I loved Alek and Deryn! They were both great protagonists, and I found myself connecting to both of them for different reasons. Usually, in books with different POVs, I tend to pick a favorite and then get annoyed whenever the story isn't focused on that person. In Leviathan's case, this did not happen. I loved both of them, Deryn and Alek, equally. I kept hopping back and forth between who I liked more until I finally came to the understanding that I loved them both. Deryn is amazing! She does whatever she has to do to reach her goals and if that means masquerading as a boy, so be it. I just thought she was so cool! She got a place on board the Leviathan and she's always swinging about, right in front of the face of danger. Alek was also pretty cool. I felt terribly bad for him and admired him for holding it together like he did. He's not some stuck-up prince. He really cares about the well-being of his men. Alek is a fighter and isn't afraid to go after what he wants. Awww I want Deryn and Alek to get together! They deserve each other! Sorry, I'll try to stop gushing. The minor characters were also lovable. Oh well, at least I tried ;) I was intrigued by Alek's loyal crew of men and fascinated by Deryn's shipmates and beasties. Another thing I loved about Leviathan was all the action! 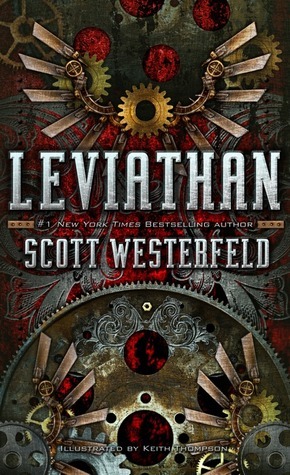 Leviathan was set during the Great War, and so Westerfeld set the scene! It was really cool, and almost every action scene had my blood pumping. Deryn was fearless; she swung from ropes thousands of feet in the air. Alek expertly piloted clunky battle machines, stunning even the best master of mechanics! In the end, I really loved Leviathan. The book was very refreshing, and it has opened my mind to other steampunk novels. I'm not lying when I say that I'm itching to get my hands on the sequel and will gladly read the third book after that.